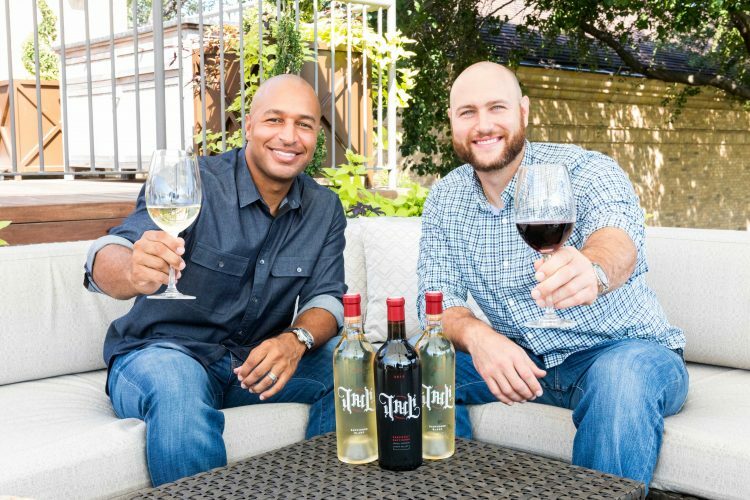 Chris Iannetta not only plays for the Colorado Rockies, a team he was recently traded to and where his professional baseball career began, he also co-owns the award-winning JACK Wine in Napa Valley, which he started in 2012 along with former Los Angeles Angels teammate Vernon Wells. Learning about grapes from his grandfather as a boy, this first generation Italian American catcher truly has wine in his blood. I was fortunate to sample a delectable bottle of 2015 JACK Cabernet Sauvignon and chat with Chris about the importance of surrounding fine wine with good friends, family, and conversation. The baseball pro has pounded over 125 home runs in his 12-year major league career and now he’s being recognized as a professional in Napa Valley too. You’re a professional ball player and had the second most home runs in your baseball career last year. You own a vineyard making award-winning wines with your former teammate Vernon Wells. You're automatically a hero of everybody reading this. What are you most proud of? That's a good question, because I look at what I've done, and I always think I can do better with everything. I never really take credit for anything that I've done. I've enjoyed what I've done, for sure. I've enjoyed the opportunity to play major league baseball. I never thought I'd get the opportunity to play as long as I have, but that's been a blessing, and it's been exciting. I never thought I'd have the opportunity to produce a wine, especially of this caliber. That came about, and I was able to do that. There are definitely things that I've enjoyed doing, but I always think, in some way, shape, or form, we could do them better, and we strive to do them better. What do you want to improve first? I think that's something that's going to happen simultaneously. I always want to play better baseball. I always want to contribute and help the team win more, every time I step on the field. From the wine side, it's a process. I want to continue to help grow the JACK brand, and grow the quality of wine into one day being a 100-point wine, and everyone knows what it is and enjoys it. You recently returned to the Colorado Rockies. It must be nice knowing your old team wanted you back. It was definitely a cool experience. I left the first time by getting traded away. You never think there'd be an opportunity to go back there and play, or that there'd be interest because obviously, you got traded. When the opportunity arose, and came up this off-season, and started talking about things, and they slowly started materializing. It looked like it was going to be a possibility, and then things kind of worked out, and it was great. Where do you consider home base? Home for me is the Massachusetts/Rhode Island area. I was born and raised in Rhode Island. I just moved to Mass, but I literally moved one town over the line. Everything's so small up there, it's pretty much all one. Mass/Rhode Island is my home. Then, I rent a place during the season in Denver, and for the six weeks in spring training in Arizona. I always love my time in Denver. I love the fans, I love the city. It's a great place to play. It's a great place to live. I was excited to get the opportunity to go back there. How’s it compare to living in the LA basin playing for the Angels? It's just different. It really is. Each place has its own nuances that make it great. I loved my time in Anaheim. I'm born and raised near the water, so being close to the water, for me, and experiencing California was really cool. I really enjoyed my time there, but knowing you're in Denver and you've got those views of the mountains, it's just a different feel. They're both really unique in their own right, and they're both special in their own right. OK, this is something I've always wanted to know when watching baseball. As the catcher, you call most of the pitches during the game, and sometimes the pitcher waves them off. How often would you say the pitchers make a better or worse call than yours? You know, really rare. It's not just as simple as answer as that. The key is, there's a quote-unquote right pitch, based on what the hitter's looking for, based on what he's showing you that he could potentially be looking for, or where his timing is set up. There's that quote-unquote right pitch that you could call, and that's what my job is, to call that pitch. However, the true correct pitch is the one that the pitcher can execute. Even if you throw the wrong pitch, and it's executed, it's still very difficult to hit, no matter what it is. Even, say, one of the best hitters is looking for a slider, and you throw a well executed slider down and away, right at the bottom of the zone on the corner of the plate, the batting average, statistically across the league, is very minimal. It's probably under .150. It's tough to say what the right pitch is. I default to: the right pitch is whatever pitch they can execute. If they shake me off, and say, "I don't want to throw that pitch right now," and I'm really convicted in it, and if they shake it off again, then I know they're convicted to execute the pitch that they wanted to throw, so that's what we're going to with. I'd rather them throw a convicted pitch that they can execute than a non-convicted pitch that I hope they can execute. Then, if they leave it over the middle of the plate, basically the batting average goes way up, so that's not what you want to do. So, what made you really serious about baseball early on? I think I liked the challenge of it. I started off just playing baseball in the backyard with family, hitting a tennis ball with a wiffle-ball bat, and I thought it was kind of fun. My parents wanted to get me into sports as something to do, and we tried baseball. I played co-ed softball for the Boys and Girls Club when I was like six or seven. That was my first experience in organized sports, and I guess baseball. That was fun. I enjoyed it. Then, I met some friends in school who were playing in a little league, and my best friend's dad at the time was a coach, so I played with them. I think I went the whole first season getting one hit, and the one hit was a pop-up to third, and the third baseman dropped it, so it was really an error. But I fell in love with the challenge, and I fell in love with the game. I watched it on TV and tried to emulate the guys that were playing. I slowly started out and had more and more success the older I got. Being a winemaker, like a baseball player, is a dream of many people as well. Which seemed like the biggest long shot to achieve? I mean, both, really. If you really were serious about making wine, you can go somewhere in the country and do it, or you can pay someone to do a custom crush for you. All it really takes is money to create a custom crush. If you really want to do it right, and you want to make a boutique wine that everyone loves, it takes a lot more than just that. Think of baseball. There's that physical hurdle that you have to achieve. Whereas the wine stuff is more financial at the very basic level. After that, you have to put passion into it to make it really good, and to have some business savvy, too, as well. I think it comes down to the business execution and surrounding yourself with the right people and making the right decisions over time to get to where you want to be. Do you think you found that with JACK? I believe so. I think we have the grapes and the juice to make it spectacular, which our ratings have already shown. Now it's executing on the business side to get the brand recognition out there, to get people aware of the brand and as passionate about it as we are. Then, purchasing bottles that they can share with friends and family, and really create memories with it. That's what we want to do. I grew up being a first generation Italian American, with wine always being on the table in my household, especially for big family dinners. My parents weren't big drinkers by any stretch of the imagination, but when we had Sunday dinner over at my grandparents' house, there was always wine on the table. It felt like that's where the conversation started, at the table. That was the epicenter of the house. That was where the heart of the house was, at the kitchen table, and that was always over wine and food. For me, it was a part of my upbringing, a part of my culture. I wanted to share that with other people. I wanted a spectacular bottle of wine to be front and center on their table, in the middle of every conversation, and every memory that they created. I wanted to bring a part of my family and my childhood and my upbringing into everyone's home, and that connection, for me, was a bottle of wine. What do you like most about your new vintage, the 2015 JACK Cabernet Sauvignon, and wine making in general? I have a personality that loves to collect. I love collecting things. It started with baseball cards when I was a kid, then it became autographs. And then I started playing guitar, and more and more guitars keep showing up at my house somehow. Oh, man, there's so many. I just appreciate it. It's so hard for me to do. It's not something that I'm good at. I'm still at the very early stages of learning, so I appreciate anyone that can play, whether it's the guy down the street, or if it's Clapton, or Stevie Ray Vaughan, or B.B. King, or whoever it may be. Jimmy Page. Just watching them, and what they can do musically. It impresses. With that mentality, I wanted to create a wine that had the ability to be approached within the first year or two of it being bottled, but also something that was going to last 10 to 20 years in your cellar that you could collect, and enjoy, and really watch and mature over time. Truly, the way to enjoy our wines would be to buy a 12-pack or a 6-pack and lay them down. Then, enjoy one bottle per year of every vintage. If you were to buy a 12-pack every year of the next 10 vintages, and then had each vintage once a month, you would truly enjoyed the evolution of the bottle and the glass over time, I think that'd be the best way to do it. How did you come up with name JACK for the winery? It's our kids' initials. I have Ashlyn and Kylie, so the A and the K, and [former teammate Vernon Wells] has Jayce and Christian. We were on the phone talking about names. I was like, "Well, it'd be cool to do some kind of a tribute to our kids, but you don't want to just pick one name, or pick one kid. How do you do it?" I was like, "Well, their initials." We were going back and forth on what does it spell, and it kind of spells JACK. We were like, "Well, how can we make this look cool?" So we designed the logo as an anagram. If you flip the bottle over, or turn the cork over, it says JACK both ways. We kind of all came together with the tribute to our kids and it was a pretty cool label. I think if you see that on the shelf, it stands out from all the other paper labels that you may see. We just wanted to make something that was going to be exceptional on every level, from the quality of glass that we use, to the name, to the logo, to when it's laying down in your cellar, having the baseball on the top, so that they always recognize it and always see it, and you gravitate to it. Where did the idea for a winery come from? Both Vernon and I had both come off trips to Napa when we were teammates in 2012, and we both had some pretty significant injuries. We were both on the DL for three months rehabbing and we became pretty good friends. We were talking about how, in baseball you're teammates for a short amount of time, but how do you maintain a friendship over a lifetime? For us, we thought it would be really cool to start a business, to start something to do after baseball. We were talking about different things, around the same conversation, and how much we love Napa, and I was like, "Man, I've always wanted to create a wine label and have land and produce something that was phenomenal. Eventually get up to be a band that's very recognizable in the valley." He was like, "Man, that'd be awesome." We kind of asked around to some of our mutual contacts, and who do we know in Napa. Through the grapevine, we hooked up with our winemaker, and it started just with me emailing back and forth questions about how we start and how we get in the business. We kind of became friends a little bit, and talked. He was like, "You know, I can help you guys create something." We had a few conference calls with him and our financial people, and we talked about what it would take and how we'd go about doing it. We started with him making us a custom crush. He gave us his website design people and we used them. And the legal team set everything up. We started off with the website and 50 cases of wine, and it went from there and started growing that into the JACK brand now, which has gotten two 94-point ratings for '13 and '14, and a 95-point rating for '15. I feel like we're well on our way to achieving something great. Technically, we already have. It's just making it approachable for the masses, as opposed to just the select few that know about it. Where can our readers find JACK wine? There are a couple of restaurants in California and some small wine shops that have it, but we really want to be direct to consumer. We want to sell right to the people. Going to our website and ordering it there is the best way to obtain it. If you sign up for our email lists, you get all the updates on what JACK's doing, and where we're going, and what events we're at. We got invited to Pebble Beach Food and Wine, Jackson Hole Food and Wine. Last year we did Aspen Food and Wine. We're doing an event at the Kentucky Derby this year. We did LA Food and Wine, and the Critics Challenge. We got a gold medal at the Critics Challenge. We got great reviews at Pebble so far, last year and this year. It was our first year doing Pebble, and we got in, and we were excited about that. This year, we're like, "Can we come back?" They're like, "Oh, yeah. You're already on the list. It's a no brainer. You're the one of the best wines there." We're like, "Oh, great." Those are things that are getting us in the right places. We fared very well on all the food and wine tastings and trade shows, so that's been cool. We'll do the barrel auction in Napa Valley this year, which we did last year as well, which was cool. You donate a case of wine. I think our case of wine last year sold for 15 grand and it all goes to charity. After the fires last year, we made a California Wine Strong t-shirt and put it on the website and social media, and I think we sold close to $7,000 in t-shirts, which we donated to the California firefighters, just as a thank you for everything they did and the amount of effort they put in to save the valley and save people around the area. We've been trying to give back, as well as grow the brand as much as possible. Do you have any final words or message? I'd just like them to try JACK wine and see what the possibilities are when it comes to sharing with their friends and family, and seeing how it enhances the experience of connecting with people. That was our main focus, really sharing our passion for wine and giving people a conduit and a reason to sit down and talk. Whether it's to start talking about the bottle and the flavors and what they like about it, and let that translate into life conversations. Hopefully by the end of the night, they've had a great experience that they'd reference. When you get back together with friends, you kind of always talk about the same things. If we can provide an avenue for that to happen with our bottle of wine, that would be great. My style is pretty low key. For me, I want to always look presentable and classy and put together, not overly loud and not overly thrown together. That's the niche that I fit in, just trying to look good and represent yourself and represent the brand well. I have a great appreciation for quality. It's not necessarily price driven, but things that are well made are always intriguing to me. I like the smell of Old Spice Swagger. Matches my deodorant and antiperspirant. Also it’s good to start every day with some swagger. American Crew is the best shaving cream out there. Even after you shave it off, add a bit of water to your face and it’s as lubricated as it was when you first applied it. Smoothest shave I can get. Wahl trimmer for my bald head and beard. It’s small and versatile so it is a staple in my travel kit. It is also the closest I can get with a trimmer. Noticeably closer to my skin than any other I’ve tried. I have eczema and Eucerin the only product I’ve tried that will keep my skin moisturized in the winter. Plus, it doesn’t smell floral so it’s unisex. Christopher Domenic Iannetta is an American professional baseball catcher for the Colorado Rockies of Major League Baseball (MLB). He previously played for the Rockies, Los Angeles Angels of Anaheim, Seattle Mariners, and Arizona Diamondbacks. He played in college for the North Carolina Tar Heels of the University of North Carolina at Chapel Hill. Head to JACKWinery.com to get some JACK wine or more information about the winery.